In this series of posts on the topic of vectors, I’ve been primarily interested in playing with situations in which the notion of a vector naturally arises. Looking at shopping lists was one of those. A shopping list is at once a single thing – a sheet of paper – and at the same time it has a collection of numbers – and the numbers tell you something about specific items on the shopping list. If the shopping list has the numbers 2, 5 and 3 on it, we still don’t really know much – unless it is understood that the 2 refers to bags of rice, and the 5 refers to cans of beans and the 3 refers to six-packs of beer. Any self-respecting shopping list would spell this out – it is primarily in math textbooks that you tend to see notations like (2, 5, 3) where the things the 2, 5 and 3 are counting are left entirely implicit. Later in the series, we looked at simple everyday scenarios like getting the total cost for the items on the shopping list, which comes from an encounter of the shopping list with a price list; the name for that encounter is inner product. There are many other scenarios in which inner products show up, and it led us to matrix multiplication, which we looked at from different angles. More recently, we examined how come almost all matrices you encounter in school are square, meaning they have just as many rows as they have columns. Since part 20, we’ve been playing with graphical representations involving pounds, shillings and guineas. Mostly, we played with the fact that one guinea has the same value as one pound and one shilling together. This fact alone let us to transformation matrices and coordinate systems where the axes are at angles other than right angles. In part 23 we pictured vectors as arrows, each with a length and a direction (but without a fixed beginning point) and then saw how a particular value – like 2 guineas and 1 shilling – could be pictured as a series of 2 guinea moves and 1 shilling move, performed in any order. These moves get their meaning from a coordinate system, in this case, with pounds on the horizontal axis and shillings on the vertical access. The blue arrow represents “one more guinea”, the green arrow represents “one more shilling”, whereas “one more pound” (not pictured) would be represented by an arrow pointing to the right. In order to get to this point, I’ve had to state several times that what we’re dealing with here is an oversimplification of the English system of currency. Not only have I left the penny entirely out of the picture, but worse, I’ve been completely side-stepping the fact that one pound is worth 20 shillings. If this has been hard for you to take, and if you’ve been yelling at the screen “why doesn’t he just convert everything to shillings (or to pounds, or to pence)”, I can sympathize. We are now in the perfect place to deal with pounds being twenty shillings. We will introduce a new arrow, a new vector, on this same coordinate grid, and this new vector will represent an exchange of 1 pound for 20 shillings. 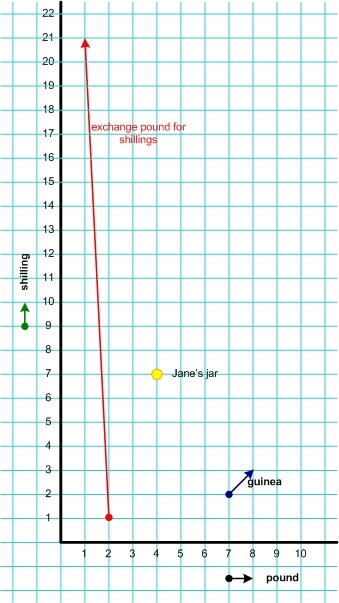 In the graph above, the red arrow represents the basic exchange of a single pound into twenty shillings. As a result of applying this exchange move, you end up with one pound less, and twenty shillings more. If we look at actual collections of pound and shilling coins, the pound (black) arrow, the shilling (green) arrow, the exchange (red) arrow, show what happens when you add a pound, add a shilling or exchange a pound for twenty shillings. The same arrows, but pointing in the opposite direction, would represent what happens if you take away one pound, take away one shilling, or exchange twenty shillings for one pound. All of these are pretty straightforward. Also shown is the “guinea move”, but in terms of actual collections of pound and shilling coins, the guinea move is somewhat ambiguous. Since the guinea only represents a value, and not a particular combination of bills or coins, identifying the guinea with one pound and one shilling is a bit arbitrary. We could have pictured the guinea as an arrow going straight up for 21 shillings. Doing it the way we did here is not much of a limitation, though: the guinea move, as shown, followed by the exchange move, will have the net effect of adding 21 shillings to whatever the starting point was. When we think of actual collections of pound and shilling coins, we know that an exchange of a pound for twenty shilling isn’t entirely without consequences. Though the exchange may be free, it may require you to go to a bank or a store, or some person on the street, and ask them to make the exchange for you. For this, the bank needs to be open, and the store needs to be open and willing, and the person on the street needs to be willing and happen to have the right number of coins on hand. If there are machines that make the exchange for you, without charging a fee, then still somebody has to feed those machines and maintain them. The true free unhampered exchange of coins for other coins only exists as an abstraction, a simplification, an illusion. But it is useful simplification. It is useful to say that one pound equals twenty shillings. or we could say, more precisely, that one pound exchanges for twenty shillings, and that such an exchange is often easy and cheap, and that we can often ignore the cost (i.e. the hassle) of doing so. We could say things like: , where indicates a pound move, indicates a shilling move, and indicates an exchange move of one pound for 20 shillings. Each represents a different path, starting from the origin, and all ending up at the 87 shilling mark. All represent the same value, the value in Jane’s jar, assuming that the exchanges are free and unlimited. This entry was posted in Uncategorized and tagged denominations, extending patterns, matrix multiplication, models, naming, whole vs. parts. Bookmark the permalink.